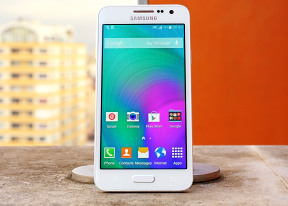 The Samsung Galaxy A3 features Private mode. It secures your selected photos, voice recordings, music and other files with a code or password. Those files are only accessible when the Private mode is unlocked and are completely hidden from their respective apps otherwise. Note that this feature works separately from your lockscreen security feature. For instance, you can have the insecure Swipe to unlock lockscreen and still have your files PIN-protected with Private mode. Samsung offers two Power saving modes on its recent smartphones. Much as on the original Galaxy Alpha, those modes are particularly welcome on the Galaxy A3 with its smallish battery. The first mode restricts the chipset performance and background data and it can even turn the screen to greyscale for extra power saving. If you really need to make those last few percent battery charge last, the Ultra power saving mode will conserve the available battery charge for as long as possible. This mode cuts off all advanced functions and even changes the homescreen to a simpler one with only six big shortcuts. Samsung has provided its own custom apps for the gallery and music player. The music player has SoundAlive presets plus a manual equalizer. It can automatically adjust the equalizer to your set of headphones with the Adapt Sound feature. It can also level out volume differences among the individual tracks with Smart volume. FLAC audio playback is supported, too. There is FM radio support, too, you just need to open the FM radio app. Samsung's Gallery shows photos by time and by album, though here "album" just means folder. One special trick that Samsung implemented is that you can filter images by person - the facial recognition software will group photos by the faces it manages to recognize. The TouchWiz gallery integrates your Facebook, Dropbox and Picasa albums so you can browse your online images as easily as local ones.